The bassoon studio at UT is among the strongest in the country, with former students holding positions in major symphony orchestras, universities, military bands and public schools. Three bassoonists have won the school-wide Concerto Competition in the Butler School of Music since 2003! The bassoon studio is a close-knit group of supportive students who enjoy playing in ensembles together and having reed-making parties. We usually have 8-10 undergraduates and 2-4 graduate students. We hold studio class once a week to provide solo performance opportunities, and a forum to discuss issues such as orchestral excerpts, performance anxiety, reed making, effective practicing, etc. We frequently have guest master classes by world-renowned bassoonists. Based on my own experience that hard work pays off by cultivating a deeper love of the art of music, I instill in my students the drive to achieve the highest level of musicianship through goal oriented practice. Since ultimately, each person needs to be his or her own teacher, and find his or her own voice, I challenge students to listen for refinements and artistry, and to develop problem solving strategies. I am insistent upon good practice habits, which we frequently discuss and put to use in lessons. My students are expected to play every note musically, with a beautiful sound and artistic purpose. Since posture, breathing and relaxation are the foundations of good tone production and technique, we frequently address those issues. I demand patient, intelligent work on technique, and constant attention to pitch and tone and phrase through heightened listening skills. My intricate system of syllabi ensures that all students are benefiting from sequential learning of scales, long-tones, single-tonguing and double-tonguing exercises, vibrato exercises, and rhythmic training as means toward technical control that enables artistic freedom. Repertoire assignments are tailored to the individual student, and usually include a balance of solo repertoire, etudes and orchestral excerpts. My high standards sustain themselves through my patient and nurturing demeanor – I love what I do. UT’s performance ensembles are among the top university/conservatory groups in the country. The UT Symphony is led by the world-renowned conductor, Gerhardt Zimmerman. The Wind Ensemble, under renowned wind conductor Jerry Junkin, is recognized as the premier wind ensemble in the country. Seven or eight bassoonists are chosen to rotate between the Wind Ensemble, Symphony Orchestra, Opera Orchestra and New Music Ensemble. Other orchestral opportunities lie with the University Orchestra, which has a mixture of music majors and non-music majors. The Wind Symphony under Dr. Robert Carnochan , and the Symphony Band under Dr. Scott Hanna, rival the top bands at major music schools. The New Music Ensemble, under Dan Welcher’s direction, hosts 5 visiting composers every year, and plays cutting edge compositions with great precision and energy. The School of Music also has about 30 student chamber music groups every semester that are coached weekly by performance faculty, and perform several times each semester on and off campus. The bassoon students have their own reed room, to which they are issued keys. It is located across the hall from my studio, and houses a Reiger gouger, two profilers, one double barrel profiler by Jim Butterfield, and one single barrel profiler by Pfeifer. There are numerous shapers and other tools available as well. Reed Making Class is required of all first semester undergraduates, and optional for all other students. It meets once a week. Austin is a beautiful city, with a lot of appeal for students. Opportunities to earn extra money playing gigs and teaching bassoon students are abundant. Band is a big deal in Texas, and every middle school and high school has a full bassoon section. My UT students are able to get as many private students as they can handle, for an excellent hourly wage. One recent graduate is now teaching 50 students, and I still get calls from schools that can’t find a teacher. There are numerous regional orchestras in which students also play, enhancing their professional experience as well as income. Currently, UT bassoon students play in the Mid-Texas Symphony, the Corpus Christi Symphony, the Brazos Valley Symphony, the Victoria Symphony, and are on the substitute list for the Austin Symphony and the Austin Lyric Opera. There are also a number of church jobs throughout the year for which students regularly play. * 3 contrasting movements that represent at least two composers. At least two of the movements must be from solo pieces and one may be an etude. * Sing a major scale and arpeggio. 4 contrasting movements that represent at least three composers. At least three of the movements must be from solo pieces and one may be an etude. Orchestral excerpts: Ravel’s Bolero, Tchaikovky’s Fourth Symphony, second movement solo, Mozart’s Marriage of Figaro overture (The entire first page). Sing a major scale and arpeggio. The university admissions office is strict with the application deadline, and will deny admission to any student whose file is incomplete on that date. It is to your advantage to submit application materials early, and double and triple check to make sure they are in your file by the deadline. In addition to the university application, please complete the School of Music application (http://www.music.utexas.edu/admissions/). 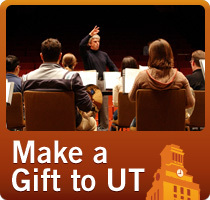 You must be admitted to both the university and the School of Music in order to attend UT as a music-major. The application deadline is less strict for graduate students, but meeting the deadline ensures full consideration for admission and scholarships. Admissions, assistantship and scholarship decisions will be made starting in the end of February, so it is advisable to audition by the end of that month. You are encouraged to attend one of the School of Music’s official audition days, but if you have conflicts, please contact me to arrange a private appointment.